Got skin envy? 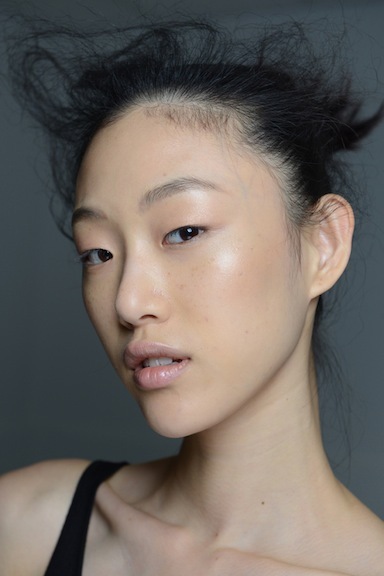 Get one step closer to Sora Choi’s amazing complexion with these beauty gadgets. Photo courtesy of beautypress.com. 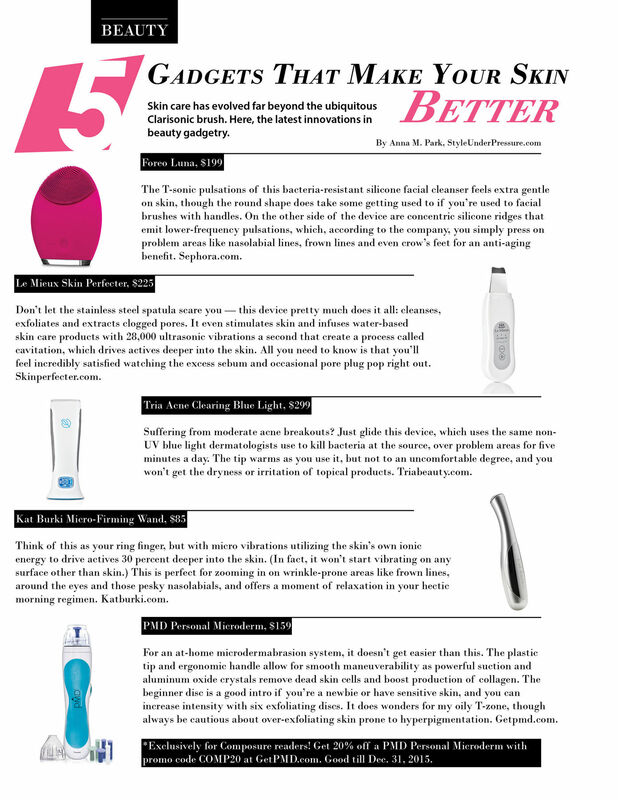 In my story for Composure Magazine‘s current issue, I tested out five skin care gadgets that go way beyond the ubiquitous Clarisonic brush. Here, the latest innovations in beauty gadgetry (plus a discount code so you can get one for yourself — read on!). 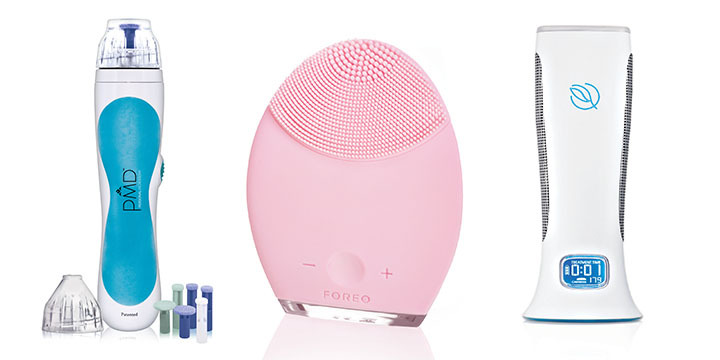 From left: PMD Personal Microderm, Foreo Luna and Tria Acne Clearing Blue Light. The T-sonic pulsations of this bacteria-resistant silicone facial cleanser feels extra gentle on skin, though the round shape does take some getting used to if you’re used to facial brushes with handles. On the other side of the device are concentric silicone ridges that emit lower-frequency pulsations, which, according to the company, you simply press on problem areas like nasolabial lines, frown lines and even crow’s feet for an anti-aging benefit. Suffering from moderate acne breakouts? Just glide this device, which uses the same non-UV blue light dermatologists use to kill bacteria at the source, over problem areas for five minutes a day. The tip warms as you use it, but not to an uncomfortable degree, and you won’t get the dryness or irritation of topical products. Don’t let the stainless steel spatula scare you — this device pretty much does it all: cleanses, exfoliates and extracts clogged pores. It even stimulates skin and infuses water-based skin care products with 28,000 ultrasonic vibrations a second that create a process called cavitation, which drives actives deeper into the skin. All you need to know is that you’ll feel incredibly satisfied watching the excess sebum and occasional pore plug pop right out. Kat Burki Micro-Firming Wand and Le Mieux Skin Perfecter. Think of this as your ring finger, but with micro vibrations utilizing the skin’s own ionic energy to drive actives 30 percent deeper into the skin. (In fact, it won’t start vibrating on any surface other than skin.) This is perfect for zooming in on wrinkle-prone areas like frown lines, around the eyes and those pesky nasolabials, and offers a moment of relaxation in your hectic morning regimen. For an at-home microdermabrasion system, it doesn’t get easier than this. The plastic tip and ergonomic handle allow for smooth maneuverability as powerful suction and aluminum oxide crystals remove dead skin cells and boost production of collagen. The beginner disc is a good intro if you’re a newbie or have sensitive skin, and you can increase intensity with six exfoliating discs. It does wonders for my oily T-zone, though always be cautious about over-exfoliating skin prone to hyperpigmentation. *Exclusively for Composure readers! Get 20% off a PMD Personal Microderm with promo code comp20 at GetPMD.com. Good till Dec. 31, 2015.